Years ago, while working as a software publisher for a very large company, I was sent an unreleased graphology (handwriting analysis) app by a programmer looking for a publisher. It was an example of what was then called an "Expert System". You answered a series of questions while looking at a paragraph of someone's handwriting alongside three of their signatures. After a garishly fanciful animation of computerised thought, it fed back guesses about the character of the author, some of them apparently accurate. If you wanted more, you could then put the samples in the post and get a detailed analysis by return. I tried this out with half a dozen colleagues and compared it to results from the widely used 16PF personality test. All the subjects agreed that the graphology results were better. It mainly illustrated how this type of analysis relies on placing whatever is being analysed into a series of simple generic categories. All the finishing touches that personalise it and make it sound accurate can then be left to the subject. "Yes! I am a person who prefers intelligent company to boozy nights out." Everyone secretly likes to believe in magic, especially magic that produces a flattering analysis of one's personality. Later, I worked on signature recognition software. 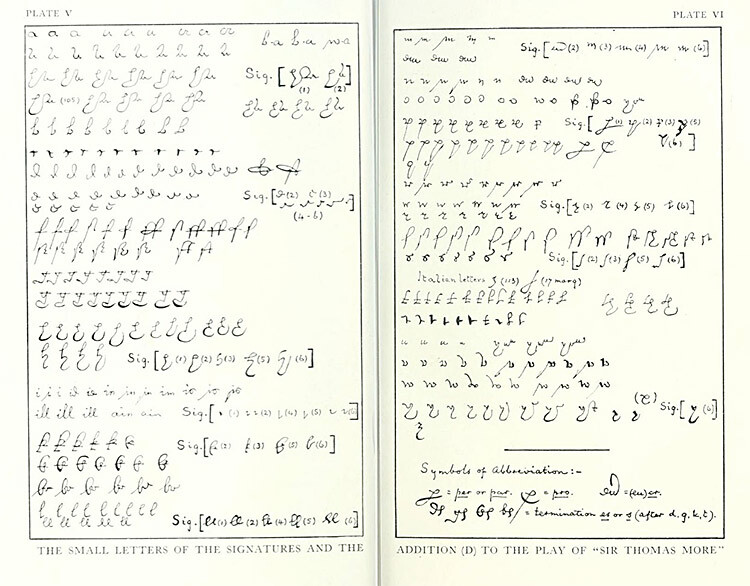 In both cases, having the original handwriting was vital because, crude as they were, both techniques relied as much on the nature of stroke and pressure as on letter form. In fact the signature recognition software designers eventually discarded analysis of letter forms altogether, preferring to use a pressure pad on the pen barrel and a touch pad to analyse contact between fingers, pen and writing surface. No reference to what was being written was needed. In the case of Will's signatures, for obvious reasons, very few scholars have been allowed to handle the artefacts. 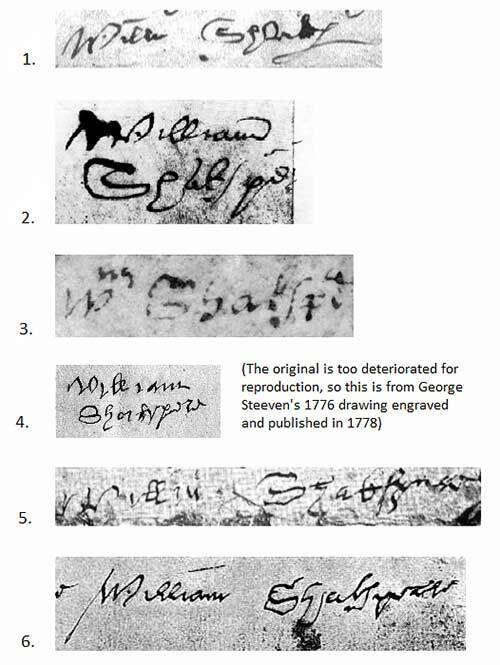 Much of the controversy surrounding Shakespeare's signatures therefore, particularly those arguments in the SAQ debate attempting to characterise him as illiterate, can only be based on elementary cod palaeography. Or Kite-Flying as it is otherwise known. Despite the availability of high-quality photographs of Shakespeare's signatures, the illustration on the left shows the collection that most Oxfordians and other anti-Stratfordians use for their analysis, taken from an engraving first published in 1817 in Shakespeare and His Times by Nathan Drake. On the right are photographs which give a better impression of how those signatures actually appear. Photographs show a great deal more than PMT reproductions. Now if you have ever tried to write with a goose quill you know that the technique of 'stroking and scratching' the paper surface, rather than pressing down hard, transmits copious information about stroke and pressure, more than almost any other writing implement. Quill tips also react depending on the surface being written on--the cheaper and rougher the paper, the more spray, blotting and inked-in loops. Still in use today for high quality calligraphy, quills transmit more personality than pencils or steel-nibbed pens. None of that, however, is discernible on digital high contrast scans or photocopies. You are not looking at Will's marks unless you are fortunate enough to be looking at the originals. What is, however, clearly discernible is that the Oxfordian argument that each signature is so different from the others that they could all be written by different people is specious. 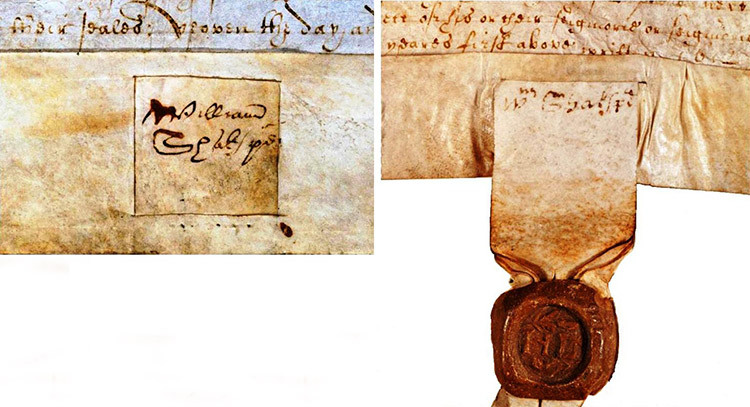 Despite the deterioration evident in the last three signatures made when a terminally ill Shakespeare was signing the pages of his will, even the untrained eye can see similarities and discern that they are sufficiently alike to be from the same hand. In every case except 3, the 'W' begins below the baseline of the rest of the signature. The 'W' in 1, 2 and 5 have a scrivener's dot in the curve of the final arm, which curves back down to the base line. The 'W' in 2 and 4 have an extra small ornamental curve attaching the final leg and the arm. The 'i's in William are made with an up-stroke and a down-stroke and left undotted. In all but signature 5, the double 'll' in William has a distinctive change of stroke at the bottom of the first 'l' and another before the second 'l' loops into the 'i'. The 'illiam' in 2 and 5 are extremely similar in both slant and letter formation. The medial 'a' in 1 and 2 are formed similarly: both are open, and both begin well above the letter. No. 1 is linked with the previous "h" and No. 2 appears as that it was at one time or that both letters were made cursively, the pen leaving the paper as the upstroke of the upward bow of the 'h' was formed. The medial 'a' in the given name of 2 and 5, and in the surname of 3, 4, and 5 are all formed the same. The initial 'S' in all the surnames are formed alike, save for the reversed loop in 5, which doesn't make it all the way over the letter. The slant of the 'h' stem in 3, 4, and 5 are the same. All of the signatures except for 4 use the italic long 's'. The 'k' is made like a 'b'. In addition to the paper, the space allowed for the signature plays a role. At least two of the signatures have been cramped into a restricted space. Just as silly as the idea that these are the signatures of different people, is the Oxfordian idea that a scribe signed on an illiterate Will's behalf. The stylish, professional scribal hand above the signature is not the same hand or even on the same calligraphic planet. Even high quality colour photographs of the original don't add much information about what the pen was doing. To make their judgements, real palaeographers work with originals, microscopes and all manner of kit they don't like sharing. Soon, maybe, we'll have 3D EMR scans enabling us to examine handwriting on our 3D tablets using free palaeography apps. This will open up a whole new ball game but for now, we must content ourselves with the work of Sir Edward Maunde Thompson, a top palaeographer from the early 20c who had microscopes and expertise galore and unfettered access to the originals. Giles E Dawson reviewed Thompson's work in Shakespeare Survey Volume 42: Shakespeare and the Elizabethans: CUP 1990. The first of Thompson's important observations takes us to a scene near the end of Shakespeare's life. We may suppose that when Shakespeare prepared to subscribe his signature to the third page of his will he was conscious of the solemnity of the occasion. Five of his neighbours stood by to witness this important signature. He started with the words 'By me', and in forming the m in 'me' he began with a little flourish, a preliminary up-stroke of the pen. This he repeated on the W of 'William'. These strokes were not a form of embellishment that he thought up on the spur of the moment. He had been making them for years, and others, a few others, had been making them for a long time. The earliest I have seen were produced in 1572. Thompson saw these embellishments, and he made a further important observation - that in making the up-stroke on the W Shakespeare began with a down-stroke. This is not readily seen because the up-stroke retraces, or nearly retraces, the down-stroke, and this can be seen only where the retracing is imperfect and leaves what Thompson calls a 'needle-eye'. The writer of the 147 lines of Hand D made use of these up-strokes. He attached them to initial i,m,n,r,v,and w, but those on m and w far exceed the others in number. In the 147 lines 65 words begin with m, and on 44 of these the up-stroke may be seen. Of 79 initial 'W's, 34 bear the up-stroke. This is analysis we cannot recreate. However hard we stare at photographs, without the originals, we can't see the up and downstrokes unless they an obvious artefact of letter formation, like the two strokes in the 'i'. Oxfordians and more than a few academics are looking for 100% certainty from Thompson's handwriting comparison. The witnessed signatures are unquestionably those of Will Shakespeare and the owner of Hand D is unquestionably that of an Elizabethan playwright who is really good at his job. There simply is no space for the Oxfordian horse and cart to be driven through the proof offered by the physical evidence, even before it is augmented with context. When we eliminate playwrights whose handwriting is known to be different, the number of candidates for Hand D sinks to a single handful. So why, when the range of possibilities is so small, hasn't Thompson's virtual certainty been accepted as definitive proof? Dawson addresses the this question and concludes that while his analysis is sound and his conclusion secure, Thompson makes a weak case overall. Thompson dismisses the pressure-based 'needle-eye' feature of Will's hand as generic. Dawson spent a lot of time looking at 250 different Elizabethan hands and found it to be much less common than Thompson implied. In fact, he found only one other instance of the characteristic down-stroke preliminary to an upstroke in the letter v in all 250 writers. There are other unusual features of Hand D which appear in the signatures which do not depend on pressure, one of which is the 'spurred a'. In line 105 of Hand D, if we look closely at the word 'that' in the middle of the line, we can see that the h-a link is exactly like the one we have been examining in the signature in having the sharp point precisely touching the up- stroke, and also the same straight line forming the bottom of the misshapen a. Again, the word 'harber' near the middle of line 127 exhibits the same sharp point (which here fails by a hair's breadth to close the circle) and the same flat-bottomed a. And compare the pointed 'a' (third word in line 119) and the a in 'against' (line109). In my examination of the hands of many writers I found twelve who linked h and a with those faddish bulbous spurs, but I found no writer who even once produced that link with the sharp point closing the circle and forming an a with a long, flat bottom. I have seen such an h-a link only in Shakespeare's signature to the Belott-Mountjoy deposition (5 A) and in Hand D.
Some Oxfordians, like Nina Green in another of her 'Oxmyths' essays, cleave for support to Samuel Tannenbaum who rejected Maunde Thompson's analysis and conclusions. Tannenbaum was a self-taught palaeographer, a psychiatrist by profession. Arthur Freeman & Janet Ing Freeman produced an authoritative work on forgery in the 19c¹, described his investigative monographs as 'fringe at best'. 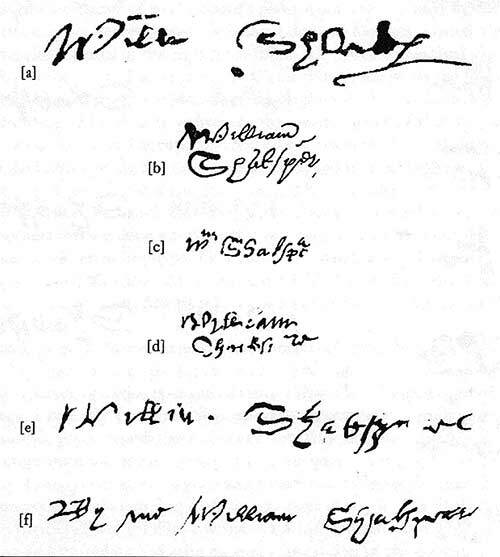 Amplifying, they point out that 'Tannenbaum’s eccentric palaeographical claims were not always sceptical, nor restricted to Collier: in 1927 he made the only extendeded modern attempt to rehabilitate Madden’s unlucky purchase of the ‘Shakespeare’ Montaigne, with its signature ridiculed by Collier himself, discredited by Maunde Thompson, and disowned by the British Museum. Tannenbaum found its genuineness ‘unquestionable." Robert Elrodt when writing in Shakespeare Survey², went further, quoting an Assistant Keeper of The British Museum, W H Kelliher, who said,"Tannenbaum’s arguments offer no serious challenge to Maunde Thompson". So. Green's claim that Tannenbaum has yet to be refuted turns out be as specious as her claim in the same document that you can't analyse handwriting by analysing handwriting. Large samples are nice to work with but small ones, especially from witnessed documents, can be used to produce results where large samples are not available. And in this case, the signatures ARE being compared to a satisfactorily large sample. So. Nowhere close to damaging the overall case. And definitely no cigar. A seventh example of Will's signature was found lurking in a border of typographical ornament in a copy of William Lambarde’s Archaionomia, a book on Anglo-Saxon law published in 1568. This volume is at the Folger library and the discovery was made after Maunde Thompson's essay but before Giles Dawson's. Despite its somewhat unlikely location and the fact that one of the Folger curators has doubts, Dawson is warily happy with it. If it's a forgery, it's a good one in an extraordinary place where it may never have been discovered. It shares a couple of the obvious features of Will's other signatures and has satisfied Dawson who cautiously concluded it was authentic. Nick Knight agreed and Sam Schoenbaum leaned towards authenticating it as having "a better claim to authenticity than any other pretended Shakespeare autograph". The best argument for its authenticity, palaeography aside, is the fact that it is written on typographical ornament - a place where it is not just difficult to see it but where it would be extremely difficult for a forger to do accurate work or gauge his success. It's a good place to put an inaccurate forgery in the hope of concealing a few inadequacies from close examination. It's an extremely bad place to put one where the letter formation will stand up to analysis far beyond the capability of contemporary scrutiny. Real or fake? It doesn't matter. 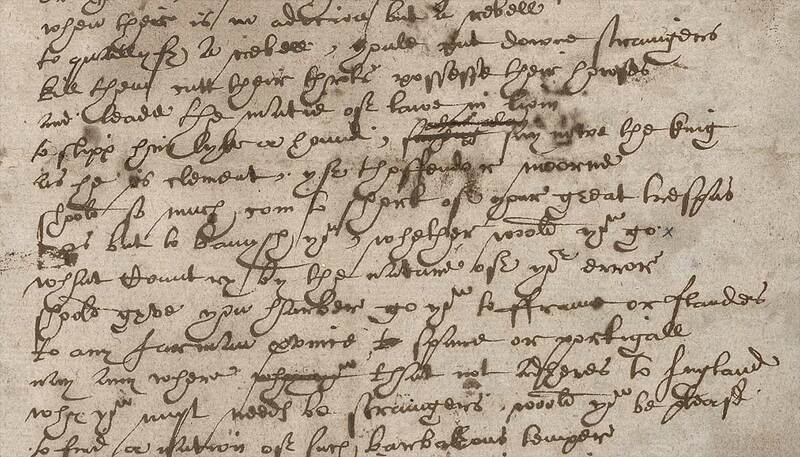 The latest news from the Folger Library seems to indicate forgery. It's importance lies only in the fact that the fuss over its existence illustrates the crumbling fragility of one of the core Oxfordian arguments, the claim that Will left nothing behind. It's authenticity adds nothing to one side of the argument any more than its lack of authentication will prove devastating to the other. of what can be seen showing through on the reverse of the title page. I strongly recommend Dawson's article since I cannot in all conscience steal any more from it. It is written in clear English, with no jargon and is (if you're not a palaeographer) absolutely conclusive. Of course he leaves a smidgen of doubt—a door open—by presenting his final conclusion in the form of rhetorical questions rather than outright statements. But then he is not expecting a horde of Oxfordians to try and get their horse and cart through a minuscule crack with amateur analysis of rough photocopies. If we return to the very small number of candidates, we can eliminate everyone except a few very talented Elizabethan playwrights, solely on the evidence of the manuscript itself. There are fewer than five possibilities. From those we can eliminate the remaining playwrights on the internal, stylistic evidence. What possible doubt is left? What then is the mathematical probability that two skilled dramatists, writing simultaneously about the year 1600, would be engaging in all of those unusual practices, some highly unusual? Above: A comparison of letterforms in the signatures and the Hand D additions. Click for larger version. Below: Enlarged photograph of the Archaionomia signature.